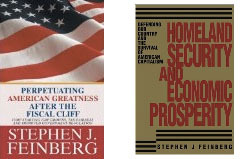 In response to the events of 9/11/2001 Stephen J. Feinberg, in 2003, published “Homeland Security And Economic Prosperity” which dealt with defending our country and the survival of American capitalism. In the chapter entitled “Identifying, Detaining And Limiting the Freedom Of Movement Of Terrorists” Mr. Feinberg described how difficult it is to prevent further terrorist acts almost anywhere in our country, He stated “THIS GAME OF WAR IS DIFFERENT THAN ANY WE HAVE PLAYED BEFORE AND REQUIRES A NEW TYPE OF DEFENSE”. He then went on to propose a US identification card, the “US ID”. He carefully described how the US ID should be issued and used to protect our “Strategic Places”. He believes it is possible, even likely, that the bombing at the Boston Marathon could have been prevented if the US ID had been issued to and required to be carried by the terrorists and all the information about them was available to all of the US government agencies responsible for homeland security. He proposed that the US ID be issued to everyone, but its use be limited to the identification of terrorists and the prevention of criminal or terrorist acts. It would not be useable to deport illegal immigrants or prevent them from working. This entry was posted in Boston Marathon Bombing, preventing terrorism, protecting strategic places, Uncategorized, US identification card and tagged th on April 28, 2013 by sjfeconomics. At today’s interest rates America’s corporations can raise billions of dollars from the sale of bonds and use the proceeds at favorable interest rate spreads to purchase state issued Jump Start America Bonds to finance major transportation construction projects. To open the door for the sale of Jump Start America Bonds, Congress should modify our federal corporate income tax laws to permit the use of Jump start America Bonds, valued at par plus accrued interest, to be used, commencing five years after issuance, in payment of federal corporate income tax obligations. This will eliminate the interest rate risk on the sale of Jump Start America Bonds. This entry was posted in economic stimulus, economics, federal deficit, government stimulus, macroeconomics, National Debt, Uncategorized on April 28, 2013 by sjfeconomics.